Lenovo has expanded ThinkPad X1 portfolio with the launch of ThinkPad X1 Carbon, X1 Yoga, X1 Tablet at CES 2017 . 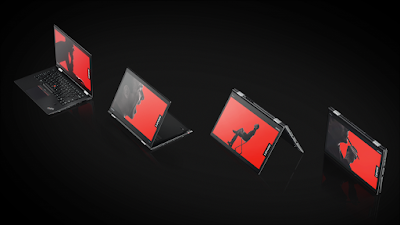 Lenovo ThinkPad X1 Yoga is a convertible notebook runs on Windows 10 experience possible with multi-mode flexibility, high performance functionality and pen use that feels more natural. The X1 Yoga excels, adapting to users’ various needs, with a redesigned rechargeable pen, a great visual experience and an improved unique keyboard. It also shares many of the improvements from the X1 Carbon, with improved security and a complete set of ports including Thunderbolt 3. Flying from New York to Tokyo or Dubai to Sydney is not a problem with up to 15 hours of battery life for the true mobile warrior. ThinkPad X1 Yoga has a 14-inch OLED-display notebook with touchscreen available today. With latest seventh-generation Intel Core Kaby Lake processors on board, the X1 Yoga is capable of delivering 15 hours of battery, Lenovo claims. Just like the X1 Carbon, the new X1Yoga also comes with two Thunderbolt 3 ports for connectivity. X1 Yoga features two Thunderbolt 3 ports. As with the other Yoga series, this one too features the signature 360-degree hinge allowing you to fold the display all the way back to use it as a tablet. The Lenovo ThinkPad X1 Yoga will go on sale starting February 2017, with prices starting at $1,499 (approximately Rs 1,02,500).